For thousands of years the Aborigines lived in tribal regions. By the early 1800s Europeans had arrived and began to settle. 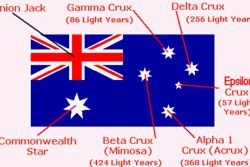 Once gold was discovered in Victoria, the population exploded with people coming from many nations. Cities and towns sprung up mostly built with great wealth from the gold discovered. For this reason, the historic features are prized and a hint of the Victorian era is felt in many small towns with the preservation of the style of the day and it must surely be the State with the most Devonshire teas. 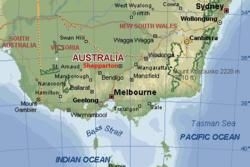 Aboriginal people lived in Victoria for many thousands of years before Europeans ever came to this part of the world. It is not known but there is some evidence that there could have been up to 100 000 Aborigines living in what is now the State of Victoria. They lived in a complex and well-developed society. More than thirty-five distinct languages were spoken by the many tribes who traded with each other and shared many common customs and beliefs. 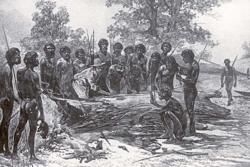 Having strong spiritual ties to the land, the Aborigines lived by hunting and fishing, and some farmed eels. The land and everything that was part of life was considered to be in harmony. When the Europeans arrived, the story is similar to other parts of the world, where diseases such as smallpox and TB decimated the indigenous population. Many more were killed or driven from their land as Europeans claimed it for farming. 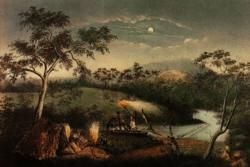 New South Wales and Tasmania were settled first but soon there was a fear that arable land was running out. So in 1824, Hamilton Hume and William Hovell set off from New South Wales to Corio Bay (Geelong) in Victoria to explorer the possibilities of this area. Soon settlers arrived with their animals and European plants. Many indigenous plants, that had been the staple food of the Aborigines, were destroyed by the planting of new crops and trampled by domesticated livestock. The Victorian State proved to be rich for farmers and from the expansive wheat growing plains of the Mallee and Wimmera region, to the lush grass-lands of Gippsland and the South Western dairy paddocks, farmers and orchardists have transformed the land. The Goulburn valley was found to be prosperous and well-situated for water and had a wonderful climate for growing fruit. The regions began to flourish. Some settlers struggled with less fruitful land and oppressive taxes. The history that inspired movies and legends of Ned Kelley, with his homemade tin armour and his gun slinging rebellion, begins in the country around Glenrowan and today, visitors can see the landmarks or buy a letterbox in the shape of his helmet. Early in the history of the State, gold was discovered and that eventuated in one of the biggest and richest gold rushes in the world. Clashes with authorities over unfair laws led to an uprising at the Eureka Stockade in Victoria, and began the union movement. This was one of Australia’s defining moments that started to forge the egalitarian values of the people of this new nation. The first gold was discovered around 1851, at Clunes, Andersons Creek, Warrandyte, and Buninyong, near where the city of Ballarat is today. The towns that sprung up like Castlemaine, Daylesford, Creswick, Maryborough and Bendigo retain the history with their quaint tearooms, magnificent architecture and well appointed museums. Today a rich vein of tourist interest and country beauty draws another stream of constant visitors who come to admire this region. Victoria had attracted many people from England and other parts of Europe. Swiss and Italian people were drawn to the Daylesford area and Italians found the Yarra Valley to be fertile for grapes. However, the greatest influx of new immigrants was after WWII. Australia needed a stronger population and there was plenty of work, as families rebuilt their lives and their homes after this war. Many English working people came out on assisted passage paying just ten pounds. The assisted passage continued until it was slowly phased-out in the 1980s. By this time hundreds of thousands of people from many Commonwealth countries had arrived. At the same time, Europe was devastated from the bombings during the war and many Italians, Greeks and Macedonians came to live in Victoria. Whole villages would sometimes migrate, and the population of Italians influenced cuisine and culture at first in Carlton and then influencing the social richness that makes up the city of Melbourne. During troubled times in Spain, many Spanish found their way to this State where the climate was not unlike many parts of Europe, dry and hot in summer and cool in winter. Other nations followed and later, after the Vietnamese war, many came from this nation and soon the numerous Vietnamese restaurants in Victoria Street had people renaming this area, 'Little Saigon'. As Australia has opened the doors to many new nationalities, Melbourne has become a vibrant city, enhanced by world cuisines and the mixing of cultures. The skills and creativity brought into the region have made Melbourne a centre for fashion and the State is an attractive option for a country or coastal holiday. Festivals abound that are diverse from the coffee festival to the Mauritian Festival and traditions and events have become world attracting, such as the Spring Carnival Racing season and the Grand Prix. The passion for the sport of AFL (Australian Football League), although enjoyed in other States, is uniquely, wildly, Victorian.